My experience at Melvin's Place of BBQ was a good one..... So why only 3 stars? Let's start at the beginning... This BBQ joint is exactly what you think of when you're looking for a place that has no time for hype, they simply want to provide good food. My dad was visiting from Michigan so I decided to bring him along to check this place out. The restaurant is an add on to his home with the dining area in his drive-way furnished with comfy chairs, umbrella for shade a large table to eat at family style. We were welcomed by three of his friends who were enjoying the weather and instantly felt like I was hanging out with old friends or relatives. Melvin appeared a few moments later with his cowboy hat and red apron asking how he could help us. We ordered a slab of ribs, no sides and he left to prepare our order. Shortly he returned with a Styrofoam container so full of ribs that wouldn't...well couldn't close completely. I was extremely excited! 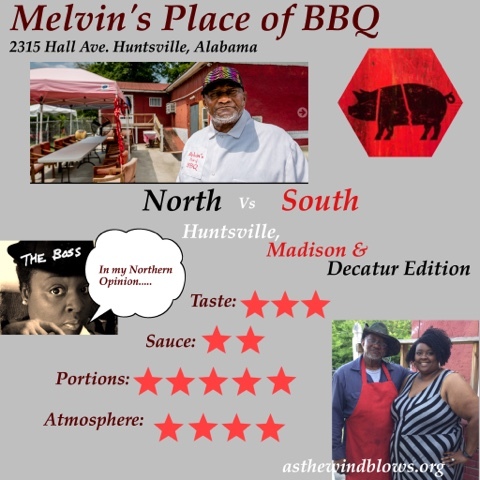 I shared with Melvin that I was a blogger and that I saw his restaurant in the Alabama BBQ app. I explained that his picture was the reason I decided to give his restaurant a try. Now when I first encounter Mr Melvin, he didn't seem overly friendly but once I showed him his picture on my iPad in the app... A smile and excitement appeared that I hadn't seen previously. He knew his picture had been taken and that the Tourism Department had been planning something but he wasnt aware of exactly how that worked. He asked if he could take my iPad inside and show his sister( I said yes, of course) and we posed for a picture together. This experience was 5 STAR for me. The Ribs: That container had so many ribs that my father, 14 year old son, husband and myself had plenty. They were very tender, completely fall of the bone, the seasoning was good but not great and a few of mine were a bit too fatty. I like a very thick sauce and Melvin's was thin but the taste of the sauce was spot on. Now, my Northern Father & Husband Loved Them! They enjoyed the seasoning of the ribs and felt the sauce was unnecessary, a added bonus. 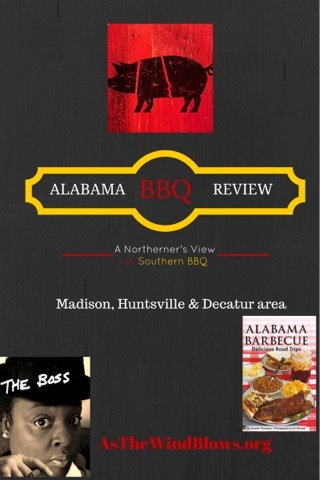 So although I haven't found my Go To Rib spot at Melvin's, it may be the perfect spot for you! Have you tried Melvin's Place? Should I return and check out the sides? Share your thoughts!